Over the last three seasons Prince Fielder has hit 130 home runs; or a home run for every 16.1 plate appearances. This season, though, Fielder has hit 15 homers in 340 trips to the plate; a jack per 22.7 plate appearances. Not only that, but Fielder’s .206 ISO would represent the lowest figure of his career since becoming a full-time player. ISO generally stabilizes after 350 plate appearances; with the season nearly halfway over, is it time to start getting concerned about Fielder’s lacking power? Fielder is hitting the same number of flyballs as his career rate and also the same number of groundballs. His batting average on balls in play is relatively steady too, meaning he’s not being robbed on screaming liners in the gap, or at least it doesn’t seem like it. Fielder’s just not having as many balls clear the wall as usual. Given his big build and specific skill set, some would point to this as the beginning of the end for Fielder’s elite status. That seems overly pessimistic. Fielder is only 26 years old and while his belt is roughly the size of an asteroid belt, that doesn’t mean he’d suddenly lose power. The popular comparison here would be Mo Vaughn. A barrel-chested, lefty-swinging first baseman with a belly and power who reached the majors at a later point in his career than Fielder, Vaughn enjoyed similar success. He hit at least 25 home runs in every season he recorded 450 or more plate appearances. It was in 2003 that injuries swamped Vaughn’s usefulness and he eventually retired, inconveniently early into his free agent contract with the Mets. But at the age of 26, Vaughn actually posted the best season of his career (to that point) with a slash line of .310/.408/.576. The big man could still hit, and did so into his early 30s. In the end, you should probably just keep Fielder on your roster, barring some unexpectedly massive trade offer. Expect some bounceback, because frankly there’s no reason not to. 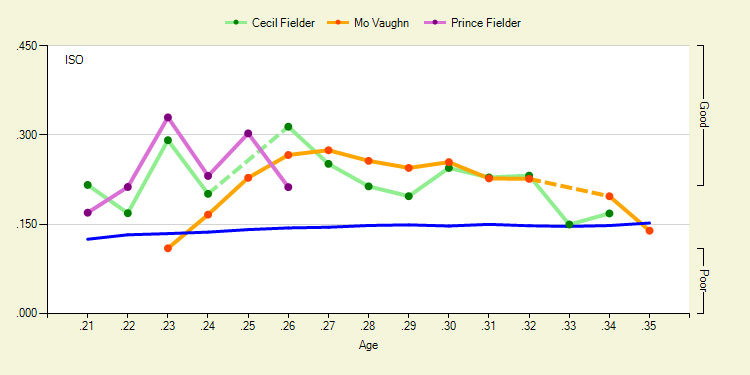 For more on Prince Fielder and other power-hitting first basemen, check out Bloomberg Sports’ Fantasy Tools.